This is a book of witticisms, one-liners, aphorisms, epigrams, words of wisdom that reflect my perception, interpretation and realization of the life, society, ideology, doctrines and system under Communist regime in Soviet Russia where I lived till the collapse of the Soviet Empire. "Peter Kirchikov is a unique voice in America worth hearing. His insightful perspectives and biting wit offer a truly original viewpoint. No subject is safe from his intelligent and often surprising insights. Do yourself a favor and take the time to savor the wonderful work of Peter Kirchikov. You won’t regret it." -- Scott Stantis, Comic Creator Prickly City, Formerly Editorial Cartoonist, The Birmingham News. 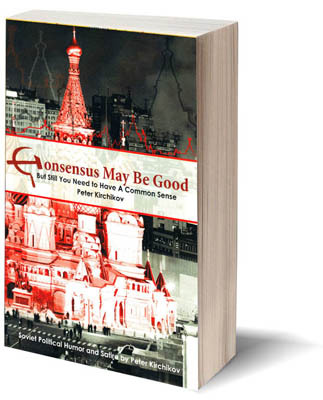 "Kirchikov's “Konsensus May Be Good, But Still You Need To Have A Common Sense” is a true and unique testimony of his poignant experience under Communist regime, accurate account of the beliefs, traditions, lifestyle, dogmas, doctrines, ideology in the Soviet Union and inevitable verdict to the system that caused the destruction of the Soviet Empire in December 1991. Having chosen satire as the way of life under the Communist regime was bold and risky for Kirchikov's life and we should commend him for his courage. He has chosen the genre of witticisms, aphorisms and one-liners known from ancient times, e.g., by Aesop, Plato, Cicero, Aristotle, Mark Twain, H. David Thoreau, Oscar Wilde, L. H. Mencken. Some of his witticisms rise to the level of sayings, proverbs and household phrases."